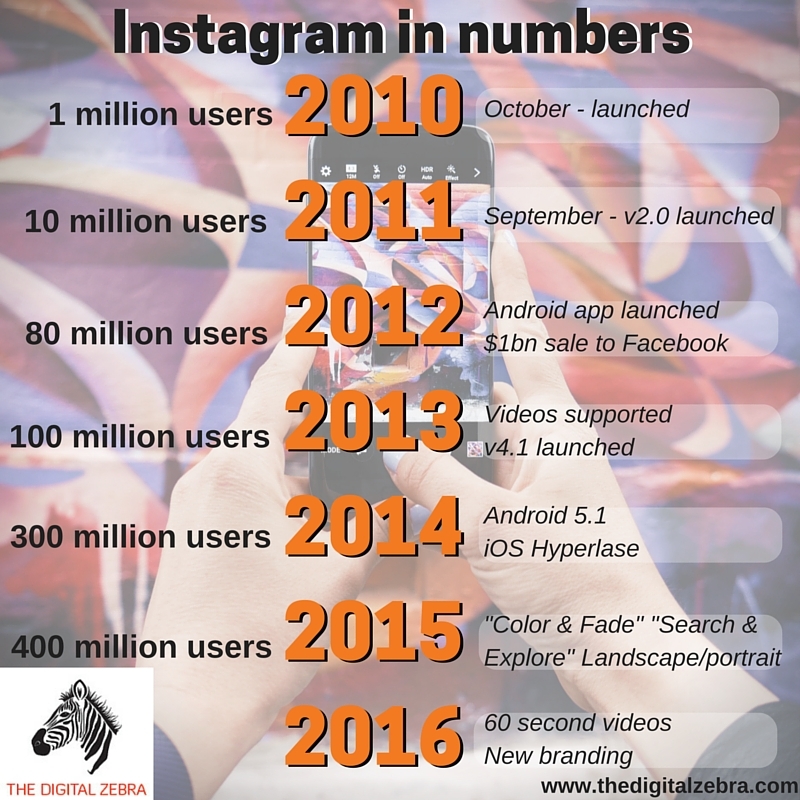 Instagram – the photo, video and image sharing site – is one of the world’s fastest-growing social media properties. With 400 million active users a month sharing 560 million images a week and “liking” an incredible 3.5 billion a day, it’s a great medium in which to get your business message across. But how? And where to start? With brands like Audi, Mercedes Benz, Porsche, McDonalds, Channel 4, CapitalOne, Coca-Cola, Adidas, KitKat, Lidl and TM Lewin all running campaigns to enhance their brand perception and promote recall, Instagram has clearly grown up as an advertising medium. But there is no need to spend vast amounts of money to compete in this space – in fact, it’s possible to advertise your business to the world using Instagram at very little cost. So, here are ten tips to help you get the most out of Instagram at the lowest-possible cost. 1. Download the app. This is the first step. Go to the Apple Store, Google Play Store or Microsoft Store and download the free Instagram app for your iOS, Android or Windows 10 device. 2. Hold on to your name. When you sign up with Instagram, you choose your unique “handle”. So, get signed-up as soon as possible to make sure you can register your own name – before someone else does. While it is illegal for another business to “pass itself off” as you, it is possible for a business with a similar name to yours to sign-up to Instagram with a name that you might want. So get in there first – claim your name and hold on to it. 3. Use your profile. When you have signed up to Instagram, you can fill in details about your business to display on the profile page. Make sure you use this. You should add a brand image (usually your company logo), the account name (usually your business name), the web address (more on this below) and some text describing your business. Make sure you use all of this. The good news is that Instagram is adding features specifically for businesses, including the ability to enable users to call, text or email you by tapping the “contacts” button; and to find directions to your business from within the Instagram app. In addition, Instagram is rolling out “insights” which enable you to monitor how your Instagram account and posts are performing and much more about exactly who your audience is. The bad news is that these features are only being rolled out in the United States, Australia and New Zealand for now. If you would like to know when these features will be available to you – wherever you are in the world – go to the bottom of this page and sign up to keep in touch with The Digital Zebra and we’ll let you know. 4. Web address. While Instagram enables one working link on your profile, this is the only place you can place a link, so use it wisely. Often the best URL to use will be your company web address. But you might also consider whether you would prefer people to link to a jump page, special offer or sign-up page. As you cannot place a link either within a post or in comments, it’s very important you choose the right place to link from the profile page. 5. Show behind-the-scenes images. Product images and prices are useful, but not always exciting and captivating. So, show images your customers would not normally see. These could be images of your back-office team, products in construction, team meetings – anything that gives your customers a deeper insight into your company and its culture. 6. Cross-promote as you post. Instagram makes it easy to push the images you post on Instagram onto other social media properties. So it’s sometimes advisable to link your Instagram account to other social media. This makes it very easy to share updates as you post them. It’s often a good idea to share your posts immediately across all social media, especially if you are posting about a time-sensitive offer. 8. Be careful how you share. Instagram makes it very easy to share across Facebook, Twitter, Tumblr, Swarm and Flickr. But not all sharing is equal. 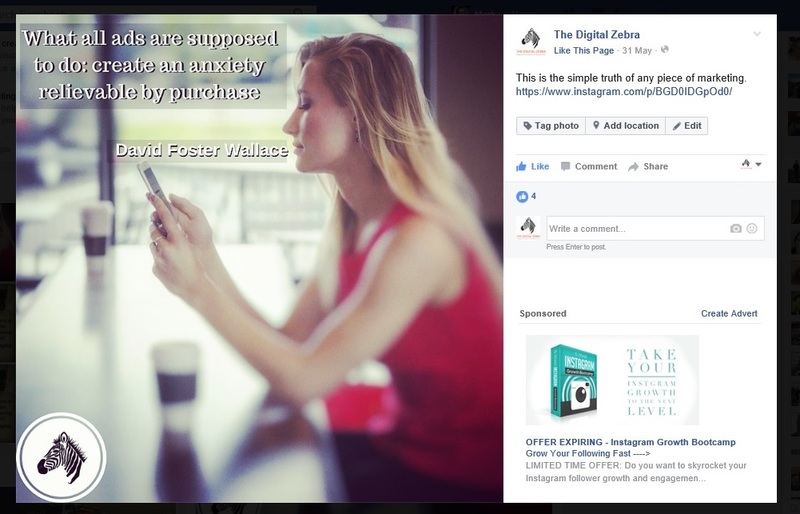 For example, an Instagram post will show up in its original, beautiful, crisp presentation on Facebook, with the image clearly shown, any text alongside it and details of who posted onto Instagram and when. But on Twitter, an Instagram post show up only as a link. So, if you want your image to appear on Twitter too, it’s often best to share the actual image – as a picture – as well as the Instagram update URL, in the same tweet. An Instagram post shared to Facebook shows the whole image within the Facebook post. 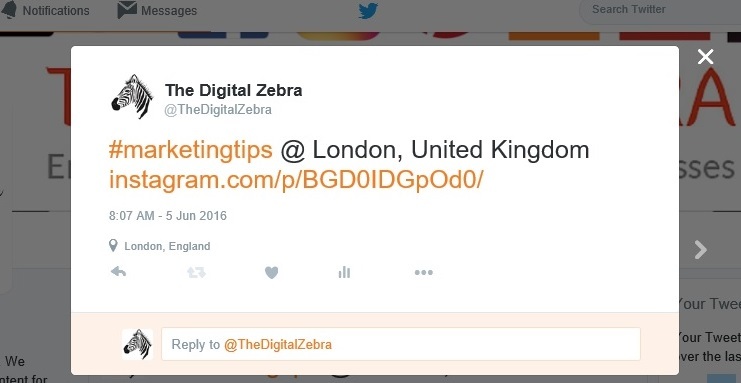 An Instagram post shared on Twitter appears as a link, after text. 9. Hashtags and tags. Like Twitter, Instagram updates incorporate hashtags, making it easy for your posts to be found and easy for you to follow relevant, interesting topics. Make sure you use them. They are more than signposts – cleverly written hashtags can be an influential part of your social media branding. It is not possible to provide full advice on the use of hashtags in this short blog – but it’s something we’ll be returning too soon. As well as hashtags, there are two other ways of tagging Instagram posts. First, you can identify the location of the image. These geo-tagged posts can very easily be displayed on a photo map within Instagram – so this is a great way of showing your customers the geographic reach and influence your company has. The second type of tag is used to show who is in the image. Tap any image you are posting and you can enter the Instagram handle of the person you can tag. Anyone viewing the post can see who you have tagged; plus, your image will be presented to that person. It’s a great way to get your message across to individual customers. 10. Comments. There are three golden rules about comments on Instagram. First, make sure you write comments on your own posts. People are first drawn to the image, but will then linger if they have interesting, relevant copy to read too. Second, leave comments on other accounts’ posts. This is a great, social way of engaging with customers, potential customers, competitors, investors, vendors, suppliers, in fact anyone. Third, always reply to comments. If someone has taken the trouble to leave a comment, it’s almost always better to respond. You don’t want to look like a brand that doesn’t listen. Any size business can benefit from using Instagram to engage with customers, promote the brand, provide business information and demonstrate an increasing level of customer service. After all, what better way is there to demonstrate you are listening to your customers than to communicate with them, their way? 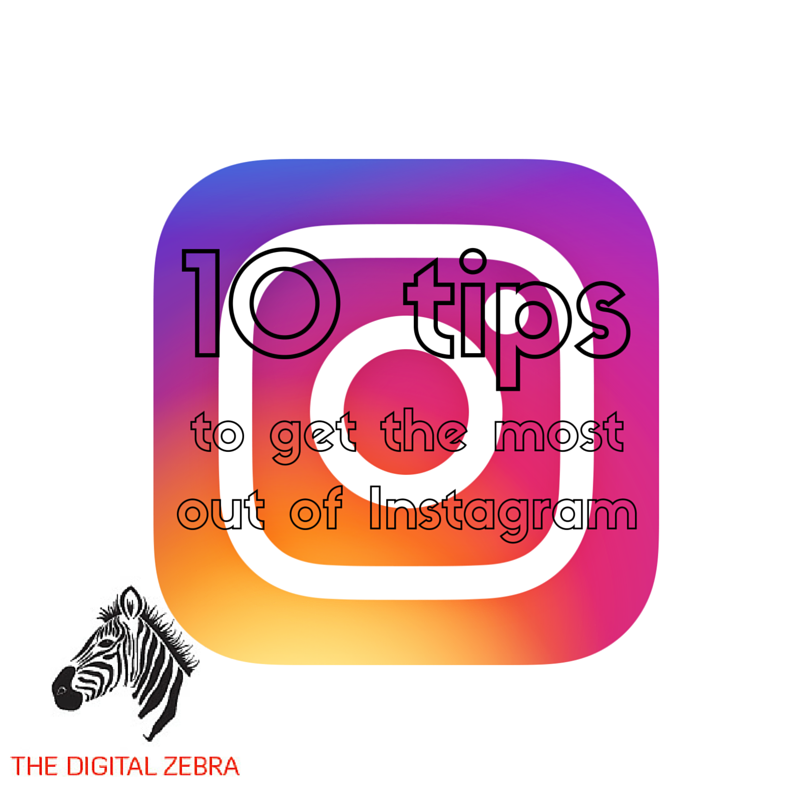 You can follow The Digital Zebra on Instagram here and sign up to stay in touch with us here. Do you want to start engaging with more customers via Instagram? Do you need help setting up an Instagram account? Or do you need a media plan, setting out what Instagram posts would work for your business? We can provide expert advice and guidance on social media campaigns to help you maximise returns and start achieving your goals as soon as possible. Email us now – info@thedigitalzebra.com.